Party in the park at The Green0844 2092555work Music FestivalParty in the park is a 4 day music festival with many famous singers and bands! Check out the line up for each day and choose to come for 1, 2, 3 or 4 days! Campsites are provided for those staying overnight. Food and drink stalls surround the Park so you will never go hungry. Shower and toilet blocks are also located on each of the campsites. With 1 main stage and 5 mini stages you will always find music you enjoy! There is also a disco tent for those who just want to dance. Click through to each of the line ups to find out times of performances. Interested in being part of Party in the Park?? please call us to book your tickets or visit our website to book online. 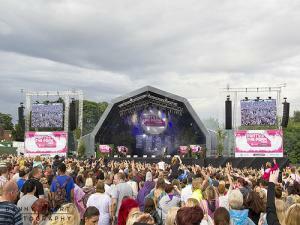 Party in the park is a 4 day music festival with many famous singers and bands!